Life's a Beach | Expat Life in Playa del Carmen : Great 2 Bedroom Condo for Long Term Rental! 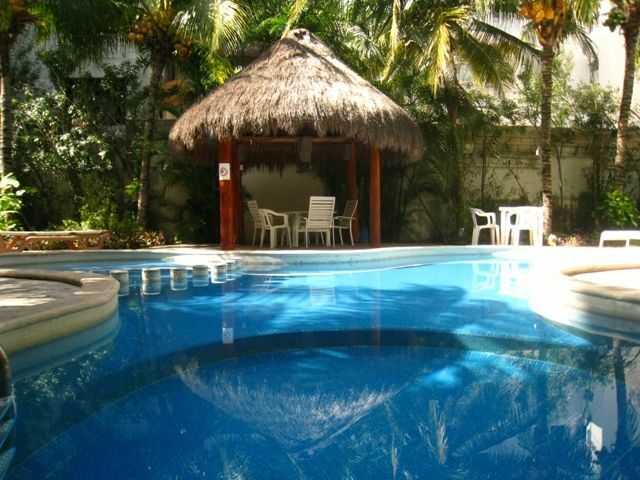 • Spacious 2 bedroom 2 bath condo in downtown Playa del Carmen - $900 USD Monthly - Available Now! Downtown, Playa del Carmen - Rent this spacious 2 bedroom, 2 full bath condominium in downtown Playa del Carmen. Located within just a few minutes walk of major grocery stores, pharmacies, produce markets schools and, of course, the beautiful beach and world famous 5th Avenue, this bright, cheerful apartment is the perfect place to live in Playa. The unit is situated on the ground floor but well above street level with the lovely tropical gardens and pool right outside your door. The apartment is fully furnished but not fully equipped so feel free to bring your own things and make this place your own! # re: Great 2 Bedroom Condo for Long Term Rental! Looks very nice and with a perfect price! I will arrive to Playa at 22nd of March with my sister and we need a long term apartment, so would this be available then? Or at the first of April? (I mean if it gets difficult to rent apart at the middle of month).. Could you please answer me by e-mail? Thank you very much for your time. Hope to hear from you soon. Please let me know if this is available for Jan/Feb/March/April 2010. Will you accept a 5 lb pomeranian?